With more than 100 years of combined experience, Cabinetry Design has become the number one place for handcrafted custom cabinetry in San Diego, CA. 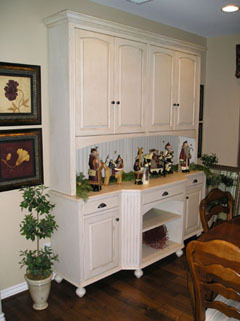 We have the knowledge and skill to take care of all your cabinetry needs. 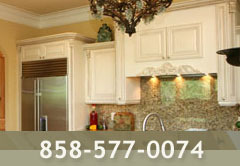 We are a full service cabinetry company that does everything from designing the cabinets to creating and installing them. Take a look at samples of our most recent designs and contact us today for more information. All cabinetry is built to your specifications in San Diego. All hardwoods and veneers are hand selected to ensure the best results. The cabinet interiors are wood veneers not plastic coated particle board. All drawers are made with wood using dovetail construction and mounted on full-extension drawer glides. We employ a custom furniture finishing methodology that utilizes the best stains and paints protected by conversion varnish. All finishes are professionally applied in our dust-free spray booth not in your home. We have considerable experience working with several interior design firms and general contractors. Cabinetry Design has become their preferred choice for high quality cabinetry primarily because of our attention to detail and our unwavering customer service. We know that your professional reputation is extended to your sub contractors. We focus on collaborating with you to deliver to your customers the most beautiful cabinetry on time and on budget.